Well-known Japanese-American Sculptor creating stone Usu in Japantown San Jose. Late November 2012, Jeff Sakai came to Ken Matsumoto's sculpture studio and asked him if he could make a stone usu. Since Ken didn't know what an "usu" was, Jeff explained that an usu was used to pound the rice for making mochi and drew a rough sketch with the dimensions. Ken purchased a granite boulder and using the machinery he's created to make art objects, Ken fashioned a large bowl that is an usu. News Archive from ARTSHIFT San Jose, 2008. Written by Neila Mezynski. If Friday night's reopening of Art Object Gallery is any indicator, I think it's safe to say that Ken Matsumoto is back in business! Due to the swift and conscientious efforts of the San Jose Fire Dept fending off a fire next door to Matsumoto's property nearly 1 year ago, the gallery is back on track. 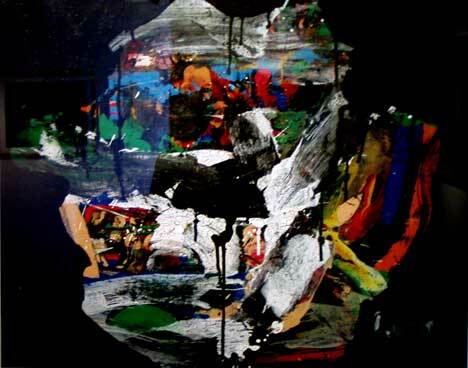 "No harm came to any of the artwork‚" Matsumoto states "It would have been years and years of work destroyed‚" his own and the gallery artists’. The walls almost did come tumbling down. It’s luck the truss and rafter tail held. Soot and debris were everywhere due to the tearing down of gallery walls, procedures of the firemen, etc., and general fallout . Then the huge efforts of cleanup and rebuilding the gallery and studios ensued. Matsumoto has had the generous support of friends and the community of Japantown for those labors. 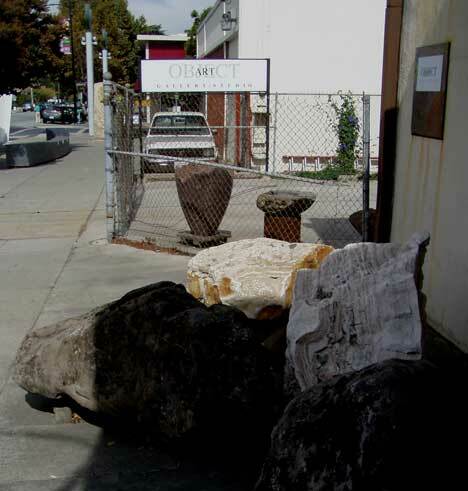 At the entrance to Art Object Gallery/Studio, sculptor Ken Matsumoto's raw materials stand guard. 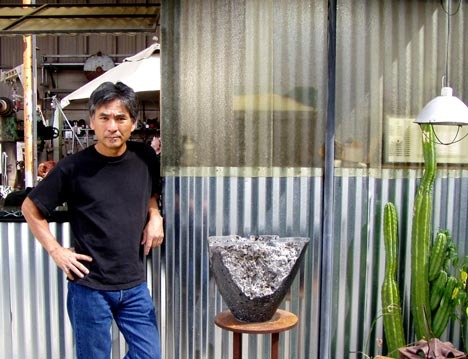 Ken Matsumoto, acclaimed sculptor, long a favorite of San Jose, was considering discontinuing the gallery due to costs, management of the space, booking exhibits, etc., not to mention the drain on his own career and work. Matsumoto offers, "The reality of the rent and the current economic situation along with the inherent difficulties of selling art make the task especially difficult." After witnessing the outpouring of love and support from friends and the community of Japantown, he has rethought folding up the gallery. Matsumoto learned how greatly appreciated his efforts had been. The awareness of the shortage of galleries in San Jose and resulting need, not to mention the potential of the space, were all factors in his decision. Sometimes it takes a near tragedy to see what's really going on. The Art Object Gallery entrance is welcoming with its outdoor bar, cafe tables and cactus garden. Ken Matsumoto, with several gallery and museum exhibits to his credit and a more recent one at the Triton Museum in Santa Clara, Ca. states, "My work is now picking up where I left off with constructed pieces using glass and silk flowers. I also came into possession of a load of paraffin wax which intrigues me no end with its translucent quality." Part of the Gallery most damaged by fire is beautifully remodeled, now featuring small bronzes by Terry Kreiter and Darrel Phelps, along with paintings and prints by Mark Bryan. 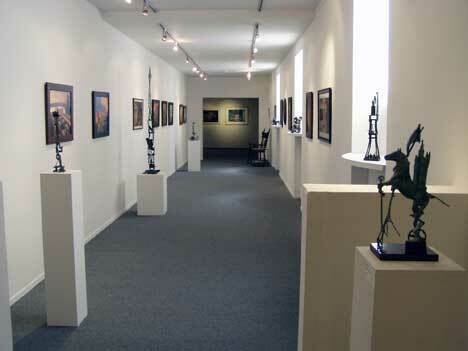 The gallery space is very large, divided into smaller rooms holding different exhibitions. Little intimate cubbyholes for some of them. Very inviting with sofas strategically placed. The rebuilt hallway, where the fire took its toll, seems quite a bit larger than before, allowing Mark Bryan's paintings and Terry Kreiter's delightful and exquisite sculptures better visibility, a welcome change. Strolling through the gallery I came upon a room featuring Matsumoto's own work. Walls painted black, formal yet intimate. Matsumoto's pieces are intriguing, suggesting a puzzle. They invite the viewer to take another look, come closer; objects inside glass structures, layered, crude rocks sit atop carved out silken smooth surfaces, balanced on twiggy legs. Formal, elegant and accessible work. The Wounded Warriors of painter's painter, Luis Gutierrez, are acrylic on paper, yet they have all the expressionistic abandon of the giant canvasses of the AE era. Art Objects Gallery new exhibit, "Current Events‚" features acrylic works on paper of Luis Gutierrez, photographs of Terri Garland and Deborah Mills Thackery and paintings of Mark Bryan. Louis Gutierrez‚ "Wounded Warrior" series entitled‚ "PTSD" (post traumatic stress disorder). His work is reminiscent of San Francisco painter, Phe Ruiz. Both using memory as an incentive; broad brushstrokes and a liberal use of paint. Highly textured surfaces, wonderfully distorted faces, crudity depicting the hell of war. 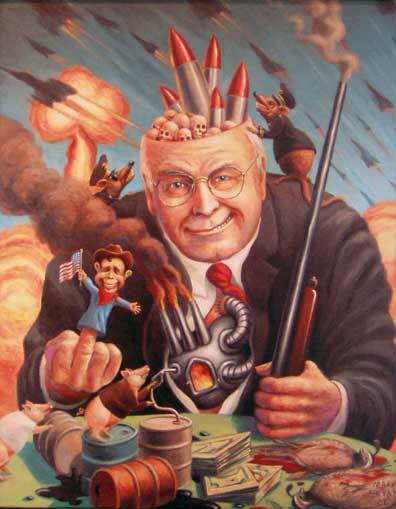 Political painter, Mark Bryan , a surrealist, pokes deadly fun at our current political situation . Plenty of good material there! Photographer, Terri Garland presents photos of Hurricane Katrina and ensuing ravaged areas depicting despair lingering in the area. 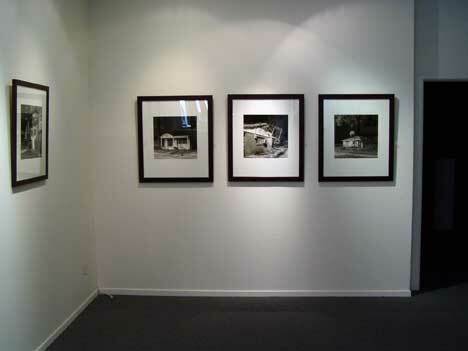 Photos revealing urban blight by Terri Garland and Deborah Mills Thackery are seen in two of the smaller galleries that have also been remodeled since the fire. Photos of Deborah Mills Thackery's urban scrawling on street objects are also on display. The exhibit runs through November 12th, 2008. Gallery hours: Thursday- Saturday 12-4:00.